In honor of Clemson's will and in appreciation of alumni and friends who make provisions in their own estate plans to support the University, the Clemson University Foundation has formed the Clemson Legacy Society. 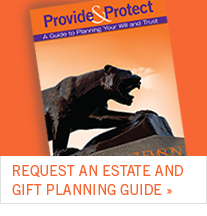 The Clemson Legacy Society in an honor society created especially to recognize individuals who have included Clemson University in their last will and testaments or as a beneficiary of a revocable trust, retirement account or life insurance policy. In appreciation of their commitment, members of the Clemson Legacy Society receive a beautiful print of excerpts from Mr. Clemson's will, done in calligraphy and sealed with the intaglio from his signet ring. Note: Please be assured that no individual bequest amounts are ever released publicly, and we honor all requests for anonymity. 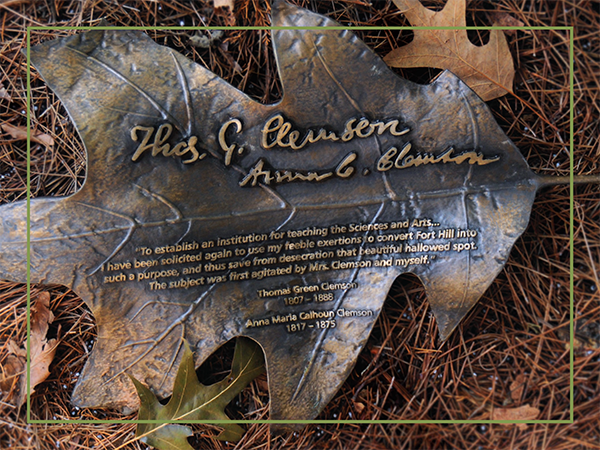 Because Clemson Legacy Society members have followed so closely in the footsteps of Thomas Green Clemson, the University initiated a new tradition to coincide with the 120th anniversary of the signing of his will on November 6, 1886. The Clemson Legacy Society Registry, unveiled on November 10, 2006, is a handsome, archival, leather-bound ledger that serves as a record to be treasured and celebrated for all time. 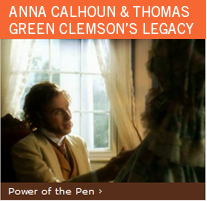 Only members of the Clemson Legacy Society are invited to add their signatures in the Clemson Legacy Society Registry, symbolizing the power of personal philanthropy and the perpetuation of Thomas Green Clemson's legacy. Members are invited to sign the Clemson Legacy Society Registry in the parlor of Fort Hill, by personal appointment, in the very room where Thomas Clemson and Anna Calhoun were married on November 13, 1838. In additional, throughout the year we offer specific dates and times for members to sign their names in this remarkable keepsake. 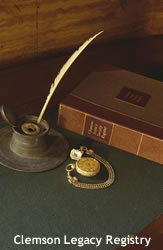 The Clemson legacy Society Registry is permanently housed at Fort Hill for display and for future members to add their signatures. The Fort Hill Legacy Society honors bequests or testamentary trust of $1 million or more when the University receives them. Fort Hill, the beloved home of John C. Calhoun, became a visionary gift from Thomas Green Clemson to the people of South Carolina. Today, Fort Hill is at the heart of the Clemson campus. 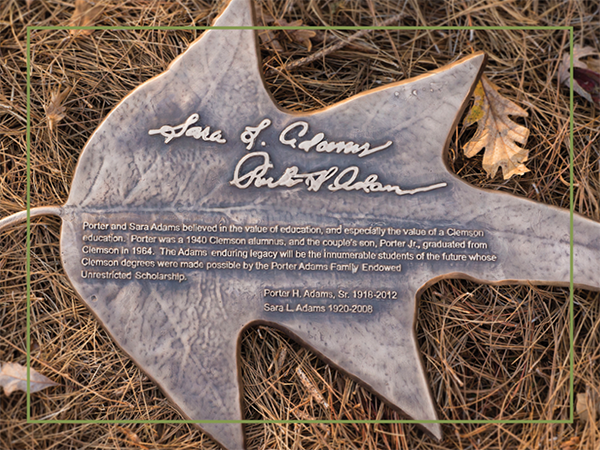 The personal signature and names of Fort Hill Legacy Society members are displayed on bronze oaks leaves affixed to the grounds of the estate where trustees first signed Clemson Agricultural College into existence. 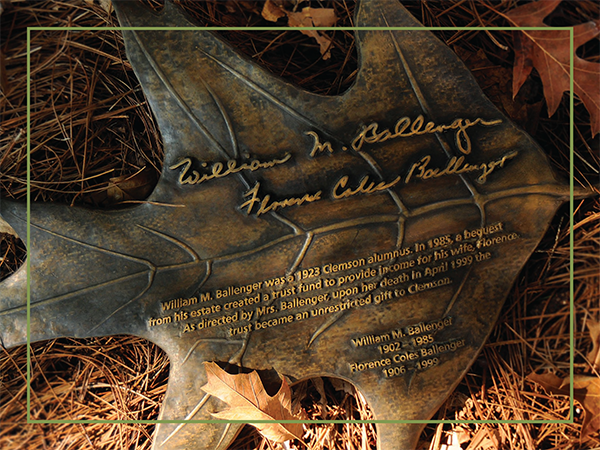 William M. Ballenger was a 1923 Clemson alumnus. In 1985, a bequest from his estate created a trust fund to provide income for his wife, Florence. 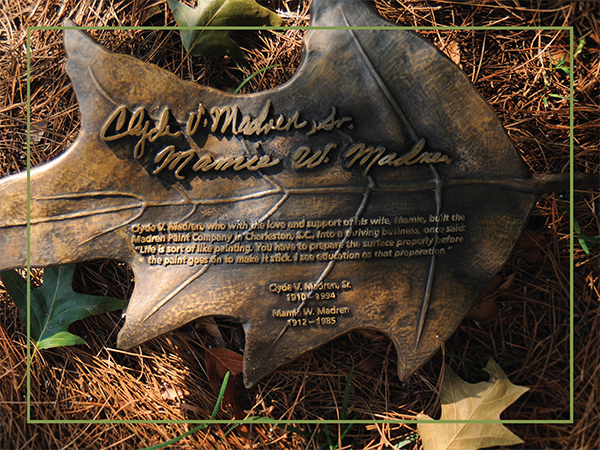 As directed by Mrs. Ballenger, upon her death in April 1999 the trust became an unrestricted gift to Clemson. Bob Brooks '60 never forgot that he was able to earn a dairy science degree because of Mr. Camp's gift to Clemson. 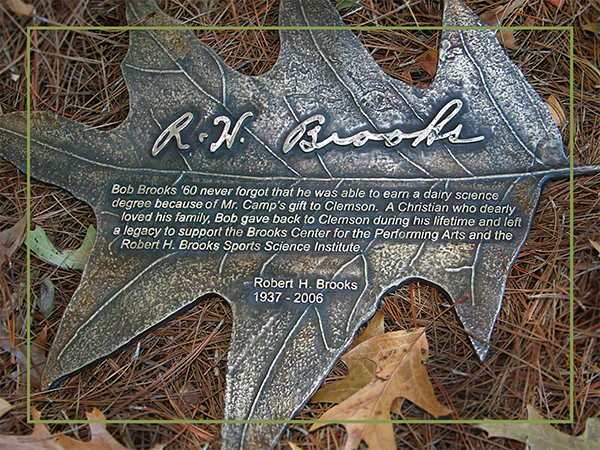 A Christian who dearly loved his family, Bob gave back to Clemson during his lifetime and left a legacy to support the Brooks Center for the Performing Arts and the Robert H. Brooks Sports Science Institute. "To establish an institution for teaching the Sciences and Arts - I have been solicited again to use my feeble exertions to convert Fort Hill into such a purpose, and thus save from desecration that beautiful hallowed spot. The subject was first agitated by Mrs. Clemson and myself." Dr. Ernest L. Corley, Jr. was a 1949 Clemson dairy science graduate who became one of the top officials in the United States Department of Agriculture. Throughout his career, he credited Clemson with opening the door to his success. 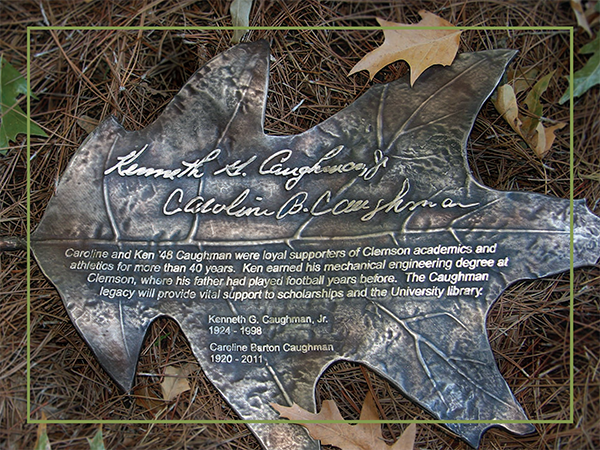 Carolina and Ken '48 Caughman were loyal supporters of Clemson academics and athletics for more than 40 years. Ken earned his mechanical engineering degree at Clemson, where his father had played football years before. The Caughman legacy will provide vital support to scholarships and the University library. W.B. 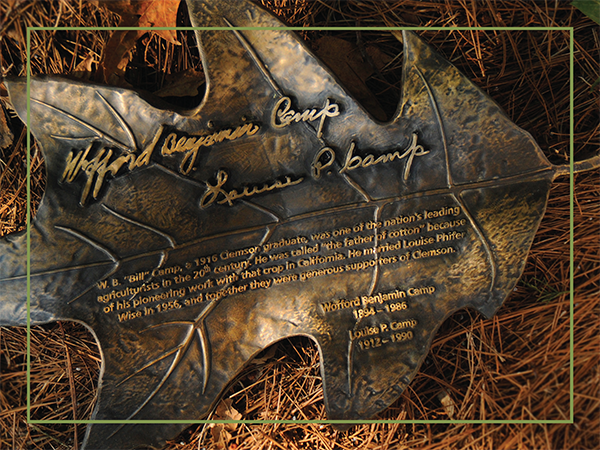 "Bill" Camp, a 1916 Clemson graduate, was one of the nation's leading agriculturists in the 20th century. He was called "the father of cotton" because of his pioneering work with that crop in California. He married Louise Phifer Wise in 1956, and together they were generous supports of Clemson. 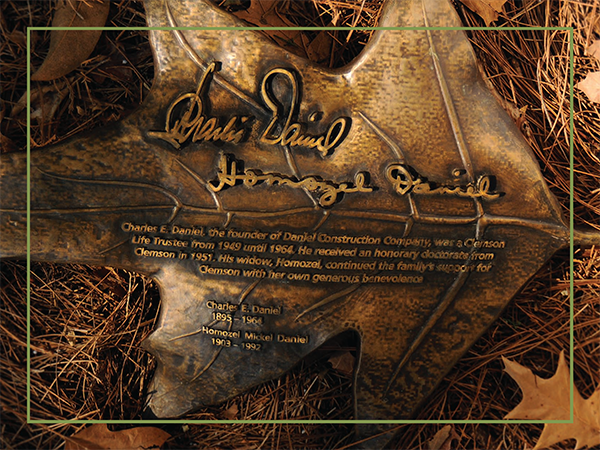 Charles E. Daniel, the founder of Daniel Construction Company, was a Clemson Life Trustee from 1949 until 1964. He received an honorary doctorate from Clemson in 1951. His widow, Homozel, continued the family's support for Clemson with her own generous benevolence. 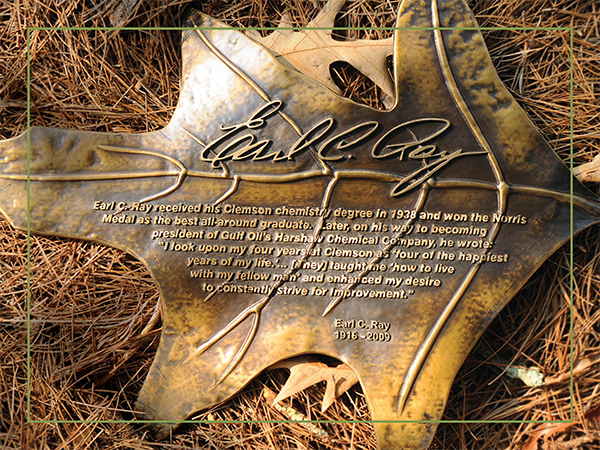 Earl C. Ray received his Clemson chemistry degree in 1938 and won the Norris Medal as the best all-around graduate. Later, on his way to becoming president of Gulf Oil's Harshaw Chemical Company, he wrote: "I look upon my four years at Clemson as 'four of the happiest years of my life.' [They] taught me 'how to live with my fellow man' and enhanced my desire to constantly strive for improvement." Clyde V. and Mamie Westendoff Madren Sr.
Clyde V. Madren, who with the love and support of his wife, Mamie, built the Madren Paint Company in Charleston, S.C., into a thriving business, once said: "Life is sort of like painting. You have to prepare the surface properly before the paint goes on to make it stick. I see education as that preparation." 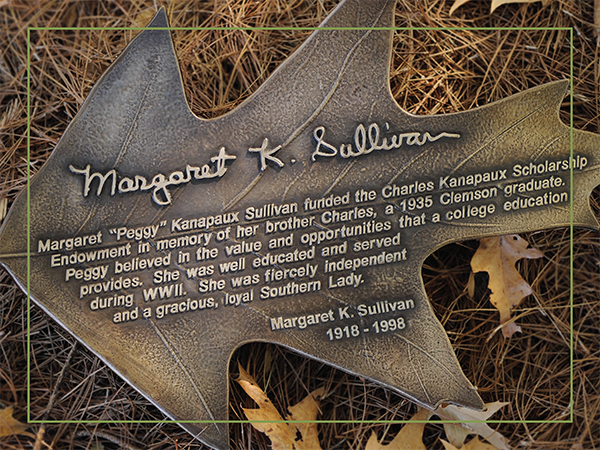 Margaret "Peggy" Kanapaux Sullivan funded the Charles Kanapaux Scholarship Endowment in memory of her brother Charles, a 1935 Clemson graduate. Peggy believed in the value and opportunities that a college education provides. She was well educated and served during WWII. She was fiercely independent and a gracious, loyal Southern Lady. 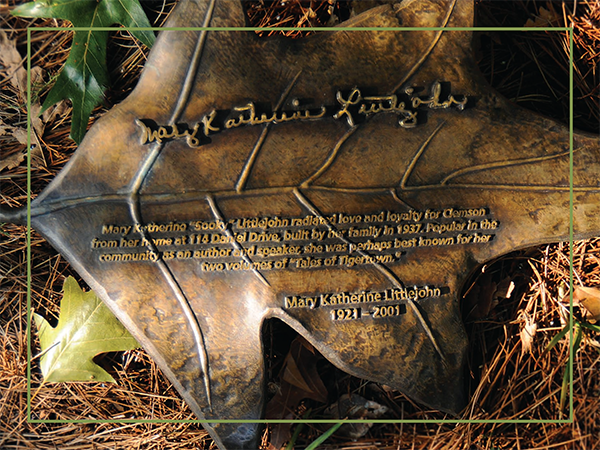 Mary Katherine "Sooky" Littlejohn radiated love and loyalty for Clemson from her home at 114 Daniel Drive, built by her family in 1937. Popular in the community as an author and speaker, she was perhaps best known for her two volumes of "Tales of Tigertown." Porter Adams, a 1940 graduate of Clemson and a Korean War veteran, spent his career educating others as a high school teacher. He and his wife Sarah believed that every level of education deserved support and demonstrated their devotion to Clemson by establishing an unrestricted scholarship endowment. The Carrolls' only son, Ernest Jr., was killed in action in 1944 during the invasion of Normandy. 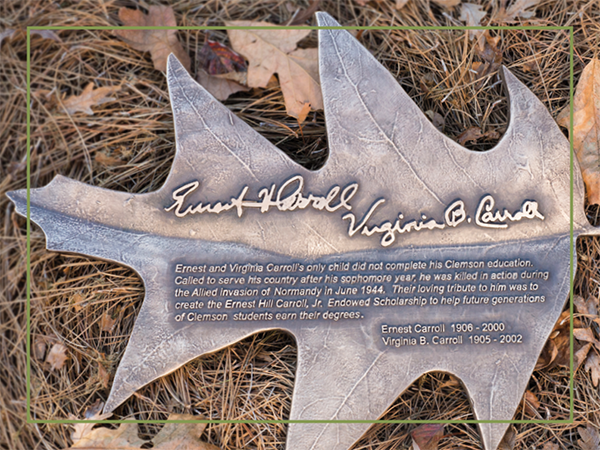 In honor of their son's sacrifice, they established the Ernest Hill Carroll Jr. Endowed Scholarship Fund at Clemson, where he attended but was unable to graduate before enlisting in the Army. A 1962 graduate of Clemson, Pat Jenkins was a U.S. Army veteran and a prominent civil engineer who believed in helping others accomplish their goals. He established two unrestricted endowments - one for the College of Engineering and Science and one for the College of Business and Behavioral Science. 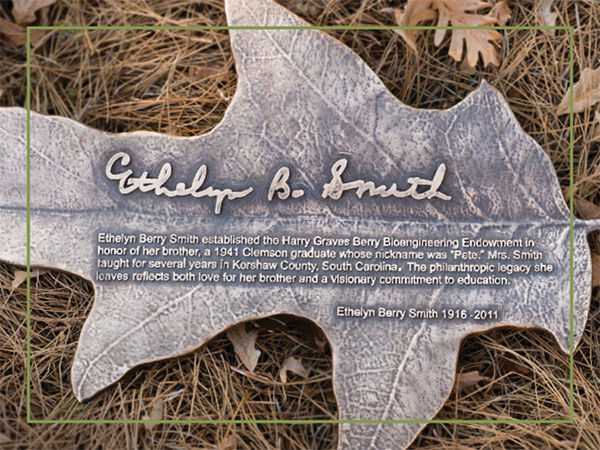 Ethelyn Berry Smith dedicated her life to education as a teacher in Kershaw County, South Carolina. 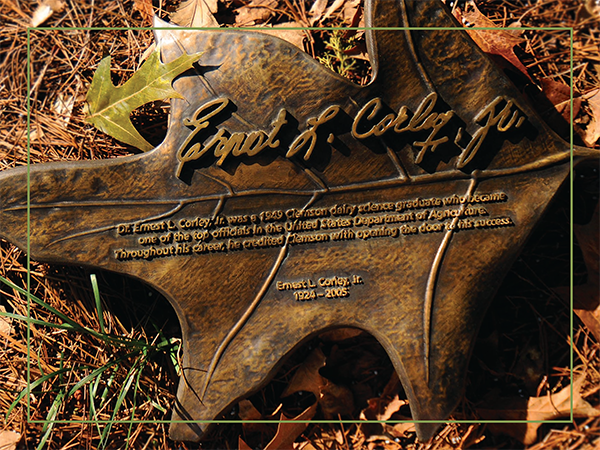 She continued her devotion to education by establishing the Harry Graves Berry Bioengineering Endowment to honor her brother who graduated from Clemson in 1941. R. Roy Pearce, Class of 1941 President, and his wife, Margery "Marnie" Walker Pearce, were dedicated to student success. Along with supporting scholarships, they provided significant funding for the Robert Muldrow Cooper Library and generously established the R. Roy and Margery W. Pearce Center for Professional Communication. They leave a legacy of opportunity and ongoing success for Clemson students. Bill Thayer, Class of 1952, served his country as an officer of the United States Air Force and served his community as a talented agricultural engineer. 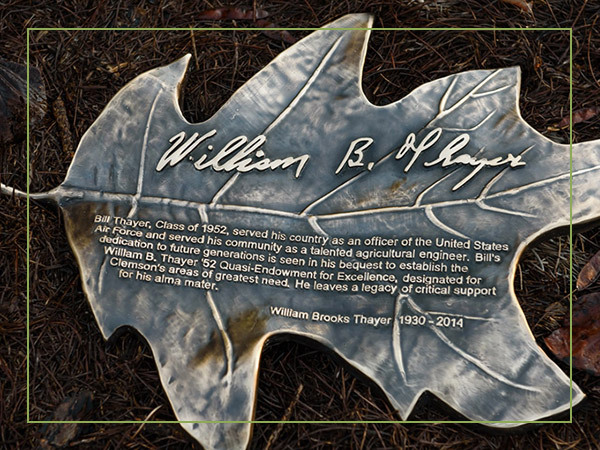 Bill's dedication to future generations is seen in his bequest to establish the William B. Thayer '52 Quasi-Endowment for Excellence, designated for Clemson's areas of greatest need. He leaves a legacy of critical support for his alma mater, and Clemson students will forever benefit from his visionary philanthropy.